Ten, nine, eight … The cool winter breeze coming off the Gulf of Mexico and the moon shimmering over the water make the perfect backdrop as the countdown begins in Port St. Joe, Florida. Seven, six, five … Your friends hoist glasses of champagne and wear grins as wide as the expanse of white-sand beach that connects the charming fishing towns of Northwest Florida’s Gulf Coast. Four, three, two … Cheers erupt and celebrations are shared as the New Year arrives, and the well wishes and resolutions last well into the next hour—until it’s time to start the countdown all over again just a few miles down the road in Mexico Beach! The neighboring coastal villages of Mexico Beach and Port St. Joe, Florida, have you covered this holiday season with a unique, fun, and safe event to help you kick off 2015. 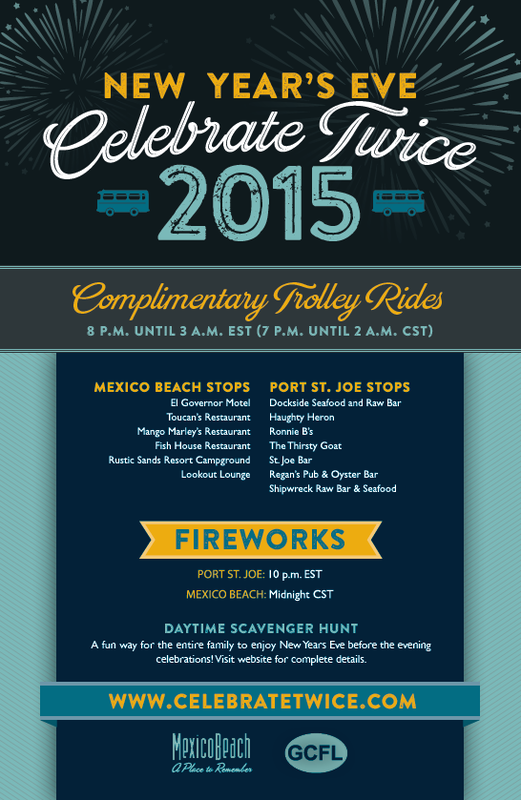 Celebrate Twice features 13 different bars and restaurants throughout the two towns and a free trolley system that makes regular stops at each one, giving guests the opportunity to celebrate the countdown to 2015 in the Eastern time zone at various hot spots in Port St. Joe, then take a short ride over to Mexico Beach in the Central time zone and do it all again—without worrying about who will be the designated driver. “Celebrate Twice is a unique event because there’s nowhere else in the country you can celebrate New Year’s Eve in two zones on some of the most beautiful white-sand beaches!” said Kimberly Shoaf, president of the Mexico Beach Community Development Council (CDC). When the local tourism leaders from the Mexico Beach CDC, the Gulf County Tourism Development Council and Port St. Joe realized there was an interest from guests who wanted to take advantage of the time zones to have twice the fun on New Year’s Eve, Celebrate Twice was created as a safe alternative to drinking and driving from one town to the next. Since then, it has become one of the area’s most popular annual events. Visitors staying in Mexico Beach can hop on the trolley at the El Governor Motel or Rustic Sands Campground, or walk from rental homes and other lodging options to any of the trolley’s six stops—strategically placed to reduce dangerous traffic—and have a worry-free night! The trollies run from 8:00 p.m. until 3:00 a.m. EST (7:00 p.m. to 2:00 a.m. CST) and will make stops for all the best live music, food, drinks and even fireworks on the beach in Port St. Joe at 10:00 p.m. EST and in Mexico Beach at midnight, CST. December 31 will also feature a scavenger hunt throughout Mexico Beach and Port St. Joe. It’s a great way for the whole family to enjoy the beautiful beaches, shops and nature in this charming fishing town before heading out to celebrate later that night. 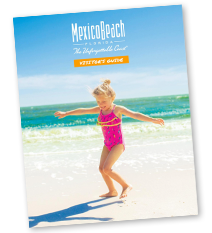 Visitors can obtain a scavenger hunt map at either the Mexico Beach or the Gulf County Welcome Center or online atwww.CelebrateTwice.com. The map will list six businesses (three in each town) that will be distributing free New Year’s Eve promotional items. Visitors do not have to purchase items from the shops in order to collect the unique hunt items. Each time a visitor collects an item, the merchant will punch their logo on the visitor’s card. Once all logos have been punched, the visitor can turn the card in to either Welcome Center for a chance to win a two-night stay for Celebrate Twice next year. Once dubbed the “Forgotten Coast,” the white sands and emerald waters surrounding Mexico Beach have long been favorites for visitors seeking a quiet, off-the-beaten-path beach retreat. With no high-rise condos and little traffic, the area was rebranded as the Unforgettable Coast®, a perfect place to get away from it all any time of year. Mexico Beach has been named one of the “10 Great Small Towns to Visit in 2014” by Men’s Journal, a “Top 10 Vacation Hot Spot” by CBSNews.com and one of the “Great American Beach Towns” by Yahoo! Travel, among other awards and accolades. Visit the Unforgettable Coast for a New Year’s Eve you’re sure to remember! Learn more at www.CelebrateTwice.com and visit www.MexicoBeach.com to plan your trip!